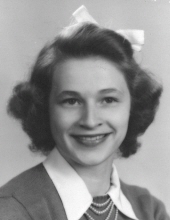 Janet Louise Blocksom Gard, 93, of Terre Haute passed away Sunday, February 3, 2019 in her residence. She was born August 11, 1925 in Terre Haute to Clyde and Hortense Mercedes Blocksom. Survivors include her favorite daughter, Nancy Gard; sons, James Gard (Patricia) and Ron Gard (Margaret); three grandchildren; and two great grandchildren. She was preceded in death by her husband Raymond Gard; parents; and siblings, Bill Blocksom, Phillip Blocksom, Elsie Dean Short, and Betty Rose Stultz. Janet was a member of Memorial United Methodist Church and formerly Forest Ave. United Methodist church where she played organ for many years. She also belonged to O.E.S. Chapter #80 of Brazil and Badoura Temple #23 of the Daughters of the Nile. She was a loving mother, devoted wife, faithful believer, a Title one aide at Lost Creek School and and bus driver. There are no funeral services or visitation. Arrangements are under the direction of Callahan & Hughes Funeral Home, 605 South 25th Street. Burial will be in Roselawn Memorial Park. To send flowers or a remembrance gift to the family of Janet L. Blocksom Gard, please visit our Tribute Store. "Email Address" would like to share the life celebration of Janet L. Blocksom Gard. Click on the "link" to go to share a favorite memory or leave a condolence message for the family.